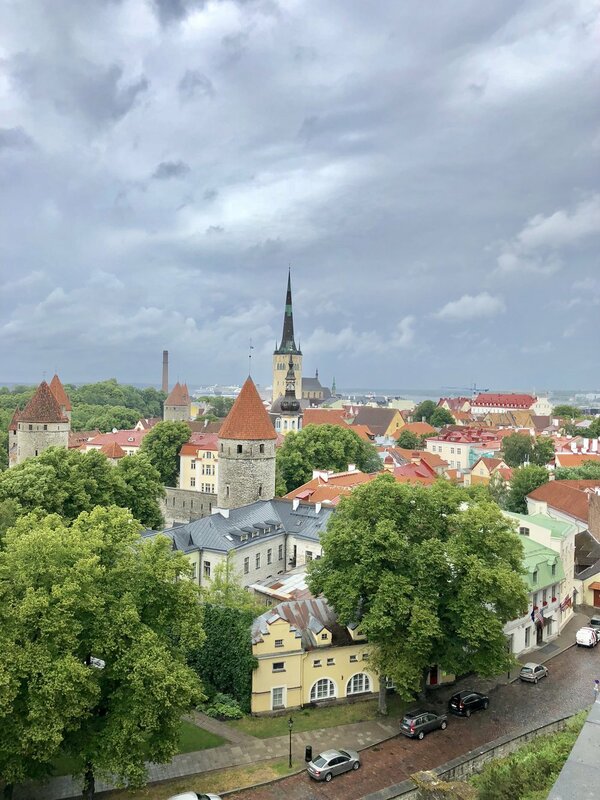 Few people know that Estonia is only a short ferry ride from Helsinki. 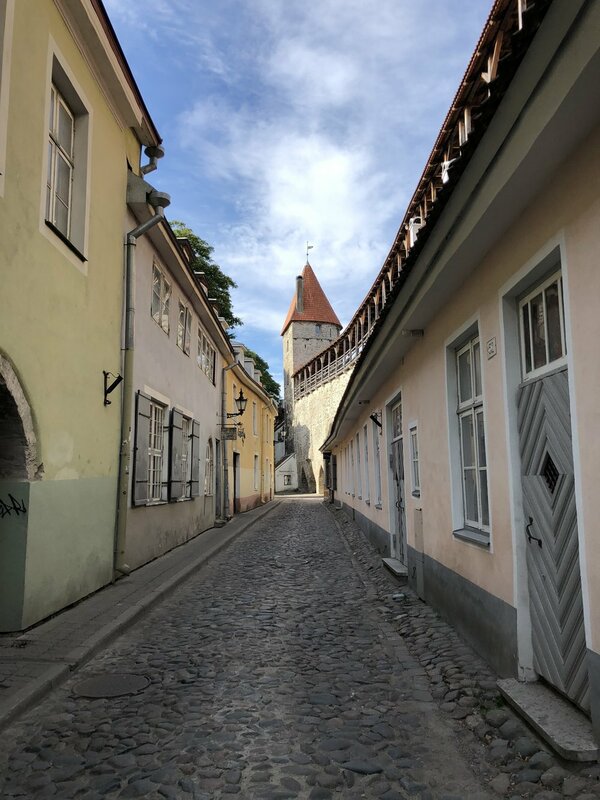 The capital city Tallinn, is considered one of the best preserved medieval cities in all of Europe. Charming and quaint best describes the old town. My journey to the Baltic states started here. People often ask why I choose such places? I choose places like this because we live in a time where everything is mass produced and disposable. We want more, cheaper and faster. I have a true appreciation for finely made “slow goods” and the stories behind the people who produce them. I combine that with my love of interior design to provide my clients unique items for their homes that tell a story. Not everything I sell in my shop is handmade, it’s not economically feasible and I would be traveling 365 days a year. But I’ve found a nice balance that I hope my customers appreciate. I always start my journeys by asking a guide to “take me to the places you would never take a tourist”. They often look at me like I have two heads. I want to go to the small villages or parts of the cities that your average traveler doesn’t venture into. I always do my research before hand. I know about weekend flea markets, towns where specialty goods are made and artist enclaves. 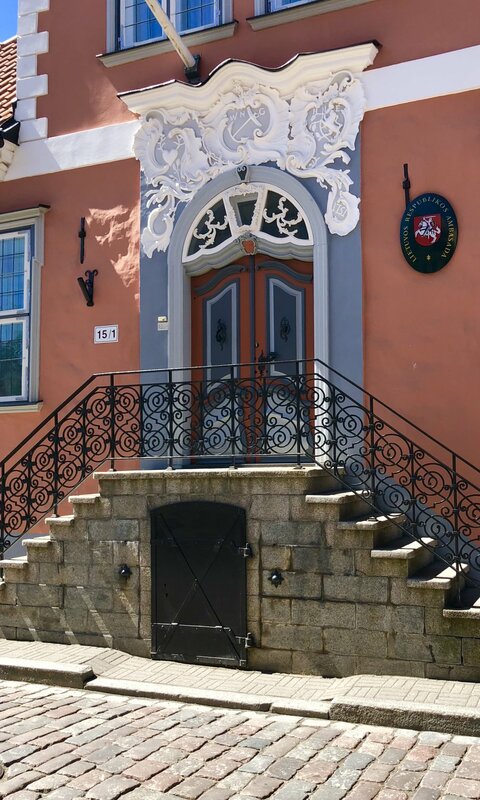 When I told my Estonian guide where I wanted to go to, she said “are you sure”? “It’s not very pretty”! Yet, Telliski is where we headed. I would describe it as very Communist looking with rows of grey concrete apartments and shops, but it’s on the verge of being gentrified and therefore, has become an area known for its local artists, designers and craftsman. Many of the artists are second or even third generation craftsman carrying on time worn traditions but, with a new twist. Knitting and weaving are a national pastime. 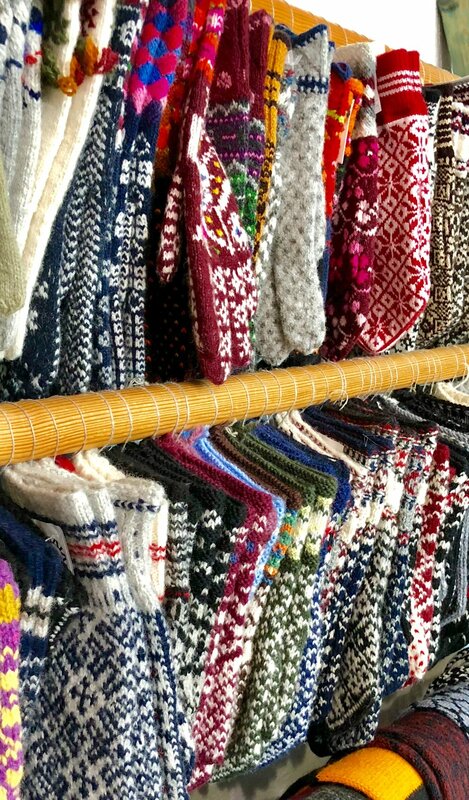 Estonia is known for its brightly colored wool mittens, hats and scarfs. Each pattern intricately knitted in various design tells the region it was made in. Not only does it indicate the region but, it’s pattern also tells a story. Deer for hunting season, snow for the holidays and flowers for the hopes of an early spring. The hand knit mittens will run you around $40 USD each but are well worth the investment when you consider the workmanship involved. I happened upon a women who was proud to show me her hand woven wool blankets, pillows and shawls. She was proud to tell me that the Estonian prime minister was seen in one of her recent creations. Each piece is a one of a kind creation woven in the softest grey, blues, blush and creams. If you have shopped in my store, you know these are my favorite tones. Other things to look for in Tallinn are household items made of juniper wood.I was up early on a Wednesday morning to hit the outdoor markets to find many stalls selling beautiful hand carved utensils, bowls and boards. If you haven’t seen juniper wood it’s a beautiful combination of wood tones and it smells wonderful. 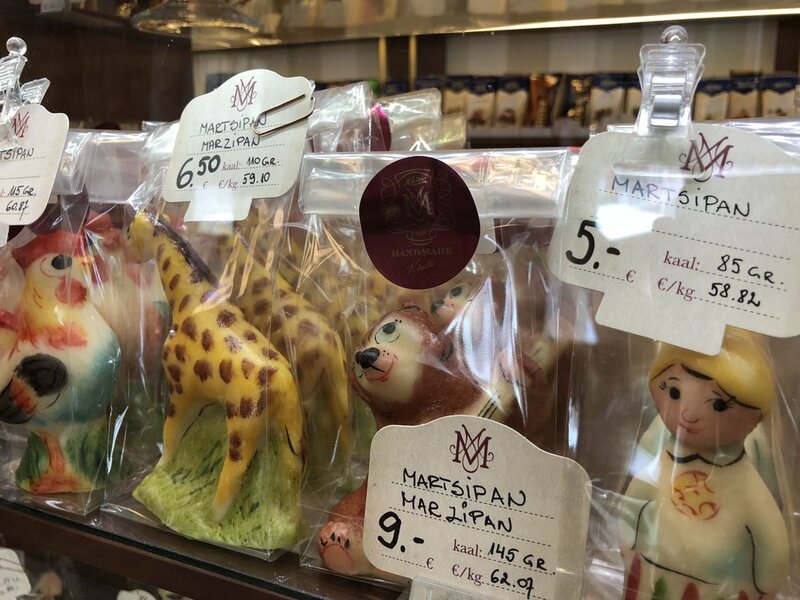 Finally, my trip to Estonia would not be complete without a visit to Kalev Marzipan store. It’s said to have been invented here for medicinal purposes during medieval times. This weak almond paste is hand molded and hand painted into the most intricate designs. 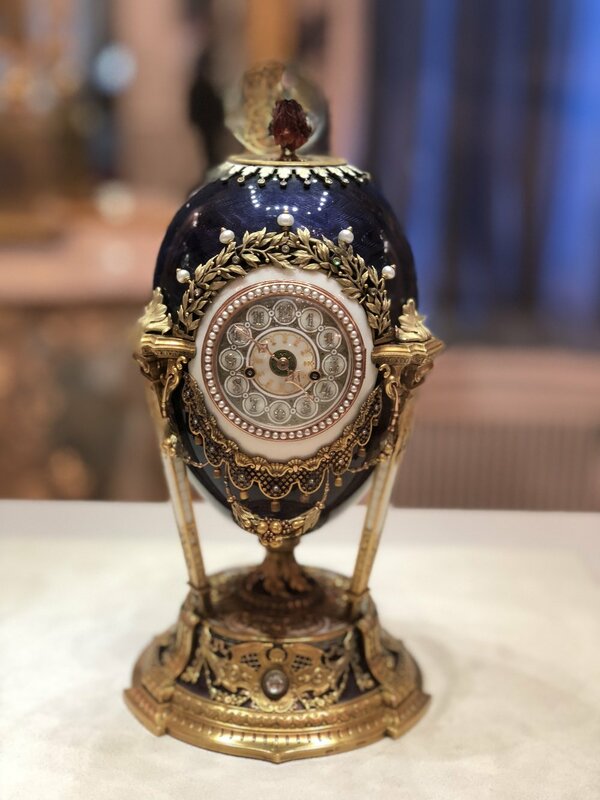 Each piece is unique and it’s a favorite gift of choice for Estonians to commemorate birthdays, graduations and christenings. Russia...it has always been on my bucket list. It’s one of those places that conjures up images of grey cinder block architecture and similarly colored food. All the things ingrained in us during the Cold War era. 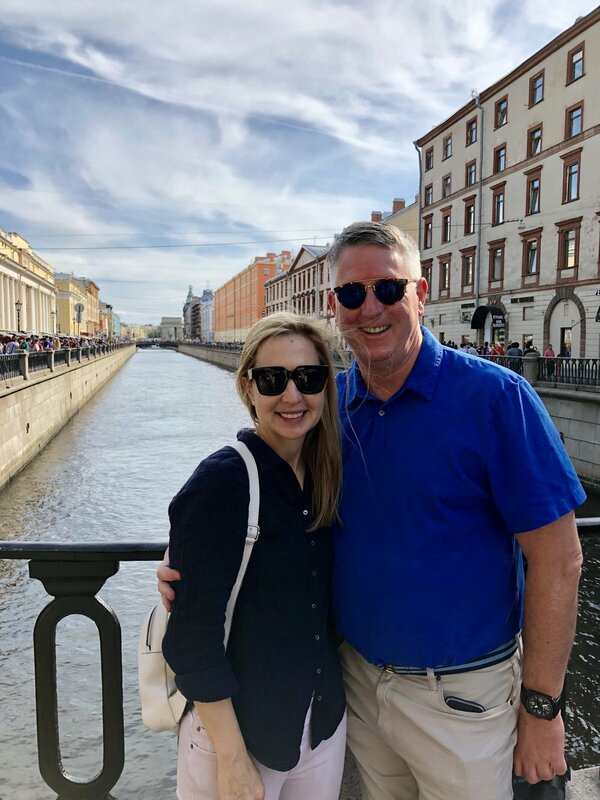 A trip to St. Petersburg changed that image for me. It’s a cosmopolitan and cultured city comprised of Baroque and Rococo architecture painted in pretty hues of blue, yellow and pink. That said, it’s imposing and doesn’t have a lot of charm. It still has a lawless, black market and underground feel to it. I experienced this firsthand within a couple hours of arriving. My mother is a huge fan of Russian history and literature. To this day, she is 92, and she can still recite the list of Russian Czars, in chronological order, and speak in great detail about their lives. The lives of the Romanov’s were discussed in fairytale like grandeur by her. 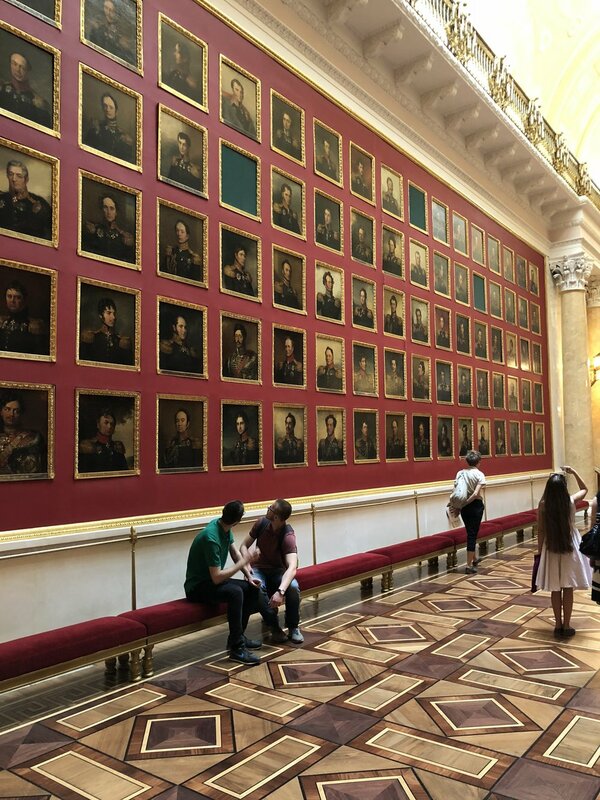 So when I first arrived I was almost giddy with excitement to visit The Winter Palace and The Hermitage. Imposing and overwhelmingly big are your first impressions. We purchased our tickets and stepped inside deciding where to start. A man in a suit jacket quickly descended upon us and asked if we would like a tour in English. We agreed, and we were quickly passed off to an older women who spoke perfect English. Approximately 45 minutes into our tour, we were surround by security guards who seemed to be speaking sternly to our tour guide in Russian. After several minutes of them going back and forth, we were allowed to continue on our tour. I asked our guide if everything was OK to which she assured me it was. Apparently it was not though, because 10 minutes later, she was being interrogated again. Shortly after the second interrogation, she came clean. She was a school teacher making $36 per week and was supplementing her income by doing “black market” tours of the museum. She asked me if I would accompany her to the museum’s head of security to answer a few questions. There I stood in front of the head of security lying for a women I had never met, explaining to them that I was a friend of a friend in Russia. Luckily, we were dismissed after about 10 minutes of interrogations and sent on our way. No gulag this trip! 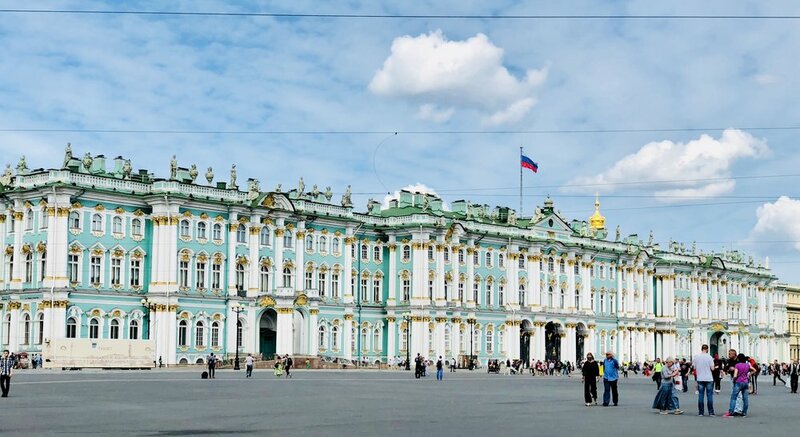 The Winter Palace and The Hermitage are spectacular sights to visit. You could easily spend days at both. 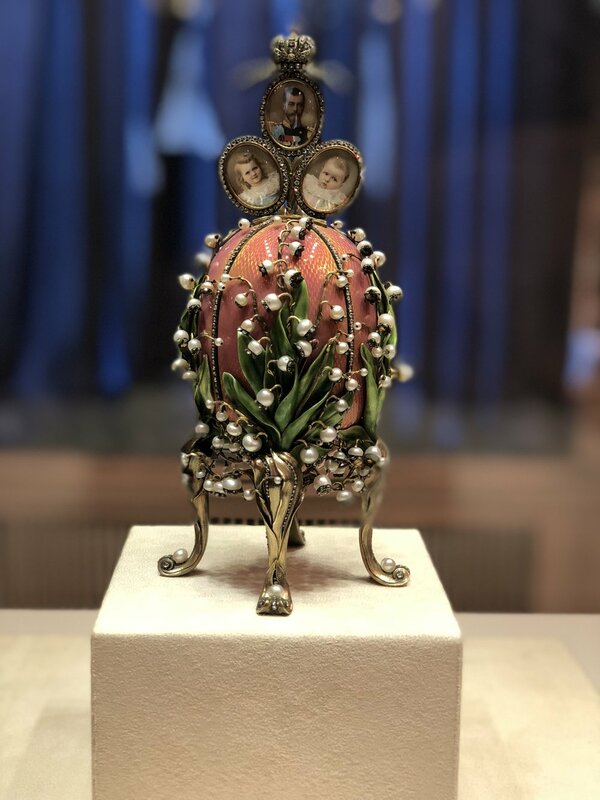 I also added the Faberge egg museum to our list and wasn’t disappointed. If you aren’t a history or museum type then it’s probably not a city for you. We also happened to be in St. Petersburg during the World Cup which probably changed its feel. Loud rowdy crowds filled the streets and sidewalks making it impossible to walk. The food isn’t great in Russia. With so many U.S. and European sanctions, the restaurants can’t get the quality ingredients they really need. Over 700 restaurants have closed in Moscow and about several hundred in St. Petersburg closed since the sanctions began. I suggest you substitute food for Vodka. Try the Vodka museum and see how it’s made and stay for a few or a few too many! What are Russians saying about Putin. Old and young Russians don’t have much good to say about the man. I was surprised at how open they were about it. Most would say they are just barely getting by with two or three jobs. A place to visit to see the Russian culture in its' full glory is the Undelnaya Flea Market on the outskirts of St. Petersburg. Here there is no shortage of vodka, local musicans and tons of old and new Russian goodies. I happened upon some pre war antique Russian lace that is going to frame up beautifuly. 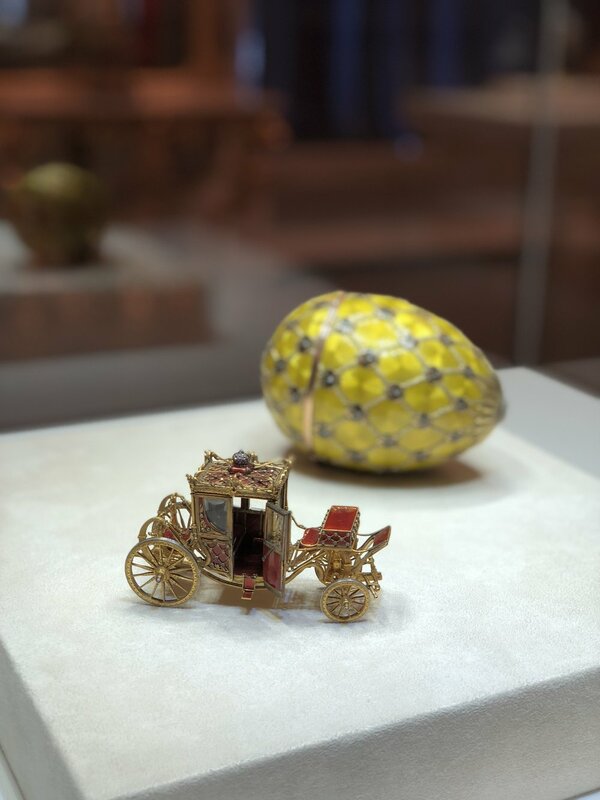 The intricate detail in the pieces are a sure sign of its' authenticity. During my bi-annual trip to Siem Reap, Cambodia, I took a 5 day detour to Luang Prubang, Laos. Luang Prabang is located in Northern Laos and sits on the banks of the Mekong River. It is a UNESCO World Heritage Site, and for good reason. Much of its French Colonial roots are still visible in the country, including its architecture and food. Though quaint and charming, it is still one of the poorest countries in Southeast Asia. Laos is known as the “The Land of a Million Bombs”. More bombs were dropped on this tiny country during the Vietnam War, than the total of bombs dropped during all of World War II. Sadly, most of the victims of these unexploded bombs are children. About one third of the land in Laos is still contaminated with these unexploded bombs. Therefore, many of the night markets sell items made from the metal of the bombs. My first morning in Luang Prabang was an early one. At 5:30 am, local monks from all of the surrounding temples descend on the town to gather alms. Gathering alms means that each monk carries a small wooden bowl around his neck, and passes by locals lined up on the streets. Each person gives the monk a small donation of food. The monks then take this food back to the temple where it is combined and distributed to feed the entire temple. I will never forget the site I witnessed that morning. I arose at 5:00 am and waited on the street. I was about 20 minutes into my wait on a hot and steamy morning; the haze and moisture hung heavy over the city. Nevertheless, hundreds of monks came out of what seemed like nowhere and from all different directions. They lined up in single file, and descended on the town. It was so quiet, you could hear a pin drop. At this moment, I felt like I was in a National Geographic episode. It was truly a once in a lifetime experience, one which I will never forget. Laos is also home to many hill tribes including the Yaun, Hmong, Lahu and Akha. Each tribe arrives at the town every evening for the night market. Many of these tribes are known for their different kinds of handcrafts. Most handicrafts include weaving with hand spun cotton, natural dyes like indigo, and intricate embroideries. Each tribe also wears a very distinctive “costume” (although most traditional dress is disappearing in favor of western style clothing). I was lucky enough to come across a Hmong women selling beautiful clutches made out of authentic Hmong costumes. The workmanship that goes into these handcafts are amazing. I couldn’t pass up the scarves, bags and table runners which were made from hand spun cotton ,and dyed in the traditional blue and white indigo. A day trip down the Mekong, on a long boat, brought me to a unique weaving village that also happens to specialize in Cobra whiskey. I purchased many beautiful scarves for the store, but passed on the Cobra whiskey. Last but not least, a trip to Luang Prabang would not be complete without a visit to the Pak Ou Caves. These limestone caves are one of the most respected holy sites in Laos. The site contains over 4,000 miniature Budhhas figures that date back thousands of years. It’s a 2 hour boat ride up the Mekong, but it is worth it. This is an incredible expedition, one that results in stunning home made goods and astonishing memories. Watch us on North Shore Television! Click below and watch our video on North Shore TV! Stop in to see the shop and talk to us about our interior design services. Hope to see you soon! It was a last minute realization that the week before Christmas might be a great time to grab a week away with my family. With my eldest daughter graduating from college and starting a job in NYC in early July, I started to panic. How many more opportunities will we have to travel as a family. It didn't take me long to convince my family that Christmas in Europe would be special experience. I selected Copenhagen, Denmark as our destination for two reasons: 1) Denmark's Christmas markets are ranked among the best in the world and I could manage to do some buying for the shop, and 2) my husband, the "foodie", was excited about trying many of Denmark's Michelin Star restaurants, including SOMA, ranked number one in the world. Denmark, in December, has reasonably mild weather but, is relatively dark and sunless. Sunset starts at 3:30 every day which I found interesting! That being said, there is a sense of coziness that this weather seems to bring. In fact, the Danes called it "Hygee". You see the word being used everywhere. Candles are even labeled with the scent called Hygee! There are five major Christmas markets in Copenhagen, all with the same festive atmosphere. Each one opens around November 19th and goes until December 23rd. 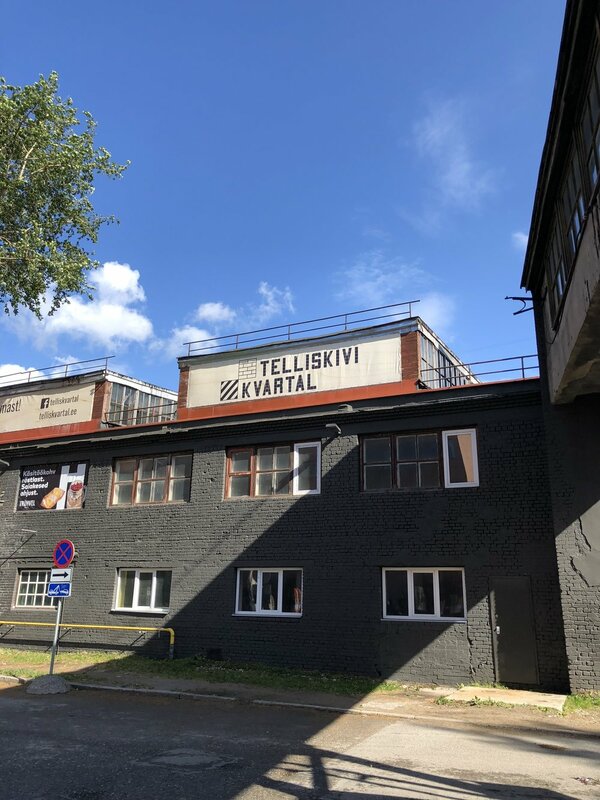 Only Tivoli is open until the 31st. Christmas is celebrated on the 23rd in Denmark so most markets are closed on that day. Each Christmas market is a series of small stalls located in a city district selling Christmas crafts and holiday food. The food is amazing! Two things they all have in common. First, is Glogg and the second is Aebleskiver. Glogg is a red wine, port wine, with whole cloves, orange peel, rum and brandy all simmered over a low heat. The Danish add raisins and slivered almonds to the mix ,and eat it with a spoon. I didn't think I would like it because it smelled so strong. It reminded me of cough syrup. Much to my surprise it was delicious and kept me warm on those cold winter nights. Aebleskiver is the Danish version of a donut but it's not deep fried. It's served with a homemade raspberry sauce for dipping. Amazing! For those of you that have shopped in my store during the Christmas holidays, you know that I commonly have some European decorations. I have always loved the Swedish Santa figure called the Tomte and the Danish version called the Nisse. They are mythological creatures that have morphed into a modern day "Santa" figurine. I couldn't get enough of these adorable creatures and brought home a suitcase full for the store. Other things to buy are boiled wool slippers, woolen items and chocolate. The chocolatiers display their pieces of dark and milk chocolate in every imaginable shape and form. It's all dusted in cocoa powder and piled high in an amazing presentation that is hard to resist. On to SOMA, the number #1 ranked restaurant in the world. I have no idea how my husband managed a reservation but he did. I'm almost afraid to ask. It's not uncommon for customers to fly to Denmark just for a dinner reservation that they may have made years in advance. If you have never heard about this restaurant, there is a famous documentary about the restaurant and its founder. It's worth watching. It will put it all in perspective. We arrived by taxi and were greeted by a staff member as we opened the door to the car. You are immediately escorted into the restaurant and warmly welcomed by the entire staff. That's right...the entire staff. This culinary journey consisted of 17 courses which included 3 desserts. The entire experience was part theater, part art and part culinary. I would say that many of the dishes were unrecognizable to me. Raw sea urchin was one of the dishes which I was only able to consume one bite. Their mission is to create dishes that are only sourced locally and are seasonal. For instance, they have one man who scours the forests in Northern Denmark in search of certain mushroom species. Another purveyor dives off the Northern coast for sea urchins. All of this comes together in the most unusual and somewhat outlandish presentation. It was certainly an experience. One thing I should mention, should anyone decide to go, is that the entire city closes down Christmas Eve, including most restaurants. There are a few restaurants open but be sure to make your reservation early. As our holiday adventure was coming to a close we settled into a comfy section in the hotel lobby for some exciting rounds of Gin Rummy. It was a perfect way to spend Christmas Eve with my family enjoying some Danish Hygee. Next day...back home to the U.S/! This is the first year that Northshore Magazine has broken out the Best of Northshore - BONS HOME Awards. Savoir Faire Home is pleased and proud to announce that we have won Readers' and Editors' Choice for FURNITURE and HOME ACCESSORIES. Thank You to our wonderful clients for making this possible. AND a thank you to Northshore Magazine for the wonderful write-up in the FALL HOME issue. Be sure to pick up a copy! isn't your run-of-the-mill home accessories store. incorporate the outstanding pieces on offer into your own decor. from European linens, to furniture, lighting, rugs, wall accents, and so much more. choosing the perfect items to enhance your own space." Thank you North Shore Home Magazine! What a lovely write up in your HOME Issue! Click here on TREASURE HUNT to read the full article. 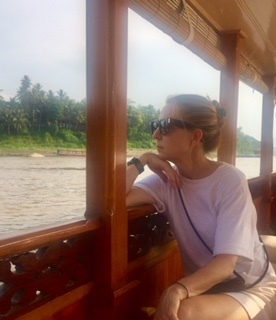 How special is Cambodia to me? It becomes readily apparent when I approach the passport control desk in Siem Reap. The officer turns the pages of my passport and responds “welcome home Mrs. Duffy”. 28 Cambodian girls who affectionately call me “Mom”. It’s late at night when I arrive with my daughter and husband but, it’s clear word has gotten out amongst the girls about my pending arrival. My IM account starts beeping upon arrival in Siem Reap and I know the girls are anxious to see us. They know it will be a fun and exciting week and a welcome break from their daily routine of chores and studying. I come bearing goodies of all kinds including Trader Joe’s chocolate cookie dough spread. 10 jars and many bags of pretzels later and it’s gone in minutes. They don’t get chocolate often if ever. The heat and the expense make it prohibitive. Arts and crafts are always on our agenda. This is something most Cambodians have never experienced at home or at school. What teenage girl doesn’t love arts and crafts? T-shirt decorating, mirror painting and collage making kick off the start of the week. To watch the smiles and laughter when the girls start to paint is just such a great feeling. So little brings so much joy! For the first time ever we attempt an ice cream party. To watch us transporting ice cream and toppings, in plastic wash tubs filled with ice, in an open air Tuc Tuc, in 100 degree heat, was hysterical. But we pulled it off! Each afternoon, when we would leave the girls' house, we would start planning our nightly activities for another group of girls. These are the girls who once resided at the PAGE house but have since graduated and are now working and going to school. Many of these graduates still live in the area and they are also anxious to see us. Years ago, I started taking some of the recent graduates to dinner every evening. That has now transformed into a nightly reservation for 18-20. We seemed to have expanded beyond just the girls to boyfriends, husbands, friends and family. Other than the PAGE graduates most of the other attendees don’t even speak English! It's funny to look around the table and see Uncle Sarem staring back at you smiling and not knowing one word of Khmer. All kidding aside,It is so much fun to see how these girls are transforming into young women before my eyes. For the most part they are managing through some of the most difficult situations and trying to stay focused on completing their education but, it clearly is no easy task. Working full time and going to school ,while still having to send money to their families, is a lot of pressure for someone just entering adulthood. My visit always culminates with a party and a couple of pinatas. It’s so much fun but, always so bittersweet to know it will be some time before we see each other again. “It’s not goodbye but see you later” I say to the girls. Before I depart I manage to visit my favorite village for ceramics. Each piece is handmade and unique to each artist. The owner recognizes me immediately and says he will now offer me a discount he only saves for his best customers. I also know that it is low season and he is anxious for some sales. 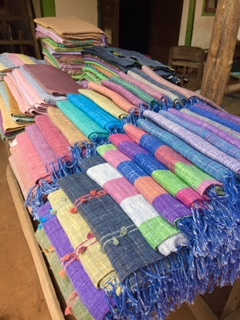 I also stop in another village to check in with my some weavers who are working on more placemats and napkins for the store. Handmade products, small artisianal workshops and and age old craftsmanship are something I can’t get enough of. Temple. In all the times I have been to Cambodia,I have never visited this site. This is the temple made famous by Angelina Jolie in the Tomb Raiders. It’s in much of the same condition in which it was found: a combination of trees growing out of the ruins deep in the jungle. It’s quite a site and I would recommend going early in the morning because it is unbearably hot and was crowded, even in the off season. Next stop, Myanmar, formerly Burma. Myanmar has always fascinated me. Twenty five years ago my husband and I visited the border between Myanmar and Thailand. I remember watching the droves of people crossing over the border into Thailand each morning looking for work. It was, and still is, a desperately poor country and at that time,most Burmese had never seen a foreigner. Clearly no one with fair skin, light hair and blue eyes. I remember standing at the border crossing admiring their traditional dress. Little did I know that I was more interesting to them. They wanted to touch my face and hair. It was just a little unsettling. Each evening they would have to make the trek across the border back home. Getting out of this country was almost as difficult as getting in. Myanmar has suffered for years under a brutal military regime until the countries heroine, Aung San Suu Kyi, won in a landslide in the country’s first democratic election. Aung San Suu Kyi was held captive in her own home for almost 15 years by the military rulers. Recently opened to tourism, Myanmar was always on my bucket list and I was eager to start this part of my adventure. We landed in Ragon, Myanmar which is the country’s largest city. It’s much more developed than Siem Reap. It’s also a much more conservative country than Cambodia. Most women still wear the traditional ankle length silk skirt,called a longyi, that is adorned with some intricate embroidery. There are far fewer westerners on th streets of Ragon. Strangers came up to us asking to take our pictures. I was told it was a sense of pride to have a picture hanging in your house with a foreigner, even if you don’t know the person. You’ll also quickly notice that most Burmese men and women wear a chalky mask on their faces. It’s made from a natural tree pulp and it’s supposed to be a sign of beauty while offering sunscreen and other benefits. Even babies have their faces adorned with this mask. On our first day we took the ferry from Ragon over to Bagan. It's a short ride to Bagan and well worth the visit. There are no cars in Bagan and I wanted to visit some of the local artisans. My transportation around Bagan was a Burmese version of a rickshaw. Of we went to my first stop. I was told there was a candle maker there who has been making candles the same way for the past 100 years. It was an amazing site to see. Big cauldrons of boiling wax being hand poured into tiny birthday candle sized molds. It must have been 120 degree in "rustic" barn. My favorite part of traveling is seeking out local artisans. This was well worth the visit. My second day in Ragon included a visit to Scotts market. It's a large sprawling market that sells everything from jewelry and silk to jade. I am in my glory searching for new and exciting pieces to bring back to the shop. 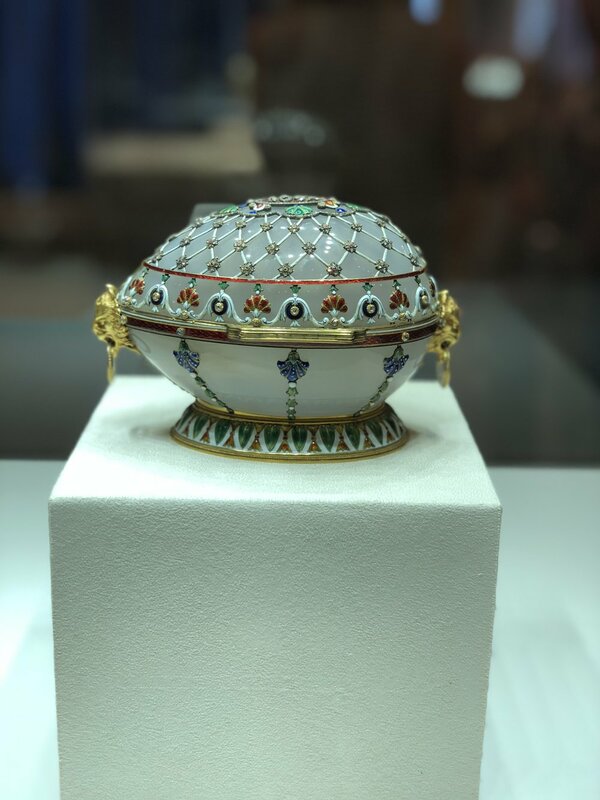 Mother of pearl, silk and embroidered bags were just a few of favorite purchases. If you come,there are few ATM's so make sure you exchange money at your hotel. Credit cards are not excepted and neither are US dollars. I've been to Bangkok at least 4 times. It's a big,busy and congested city. My main reason in visiting Bangkok is to go to the world famous Chatuchak Market. It's only open Friday evening through Sunday evening. It contains everything from rare and exotic animals to cutting edge clothing designers and housewares. I love this market and it continues to fascinate me. The Thai vendors love to bargain and it becomes silly when you realize your fighting over pennies. You can get lost in this market and it's advisable to take a map. We spent 8 hours there one day and only covered 1/3 of the market. I think I like it so much because, many of the Asian markets I visit, I see the same items over and over again. 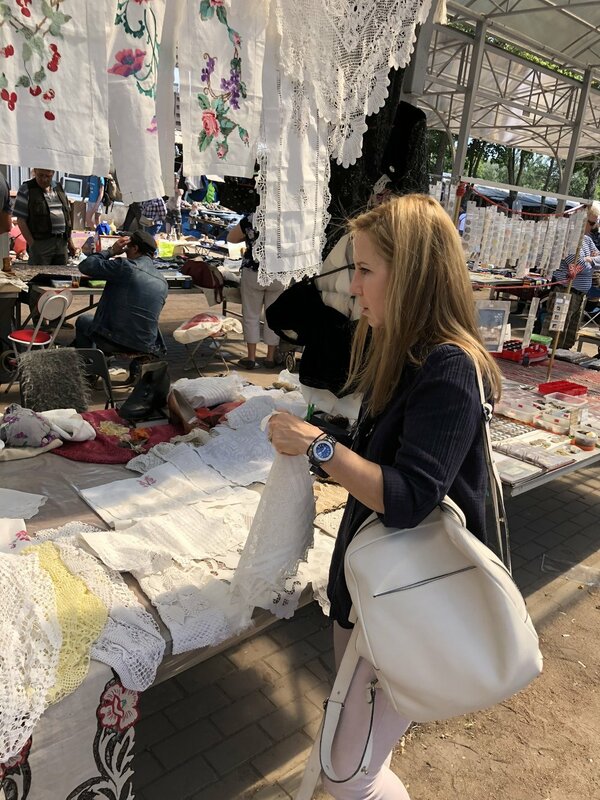 This market is unique and contains many local designers selling one of a kind items. My next stop in Bangkok is to Siam Discovery. I have been very fortunate in my business to experience double digit growth. I'd like to think it's because I seek out the unique and unusual and create a shopping experience that is not the norm in the US. I am always on the look out for cutting edge lifestyle retailers that I can learn from. I hit the jackpot with Siam Discovery. Normally ,when I hear the word mall I think of cookie cutter stores selling mass produced items. This mall was the exception. It's hard to describe why it was so special. I headed straight up to the home accessories section and it didn't disappoint me. Row after row of long tables divided into small sections. Each section displayed a very small sampling of one-of-a kind artist and home ware designers. Each designer had their web site prominently displayed and a bar code to scan if you wanted to view,or purchase, more items from the vendor. It just made shopping such a adventure. Siam Discovery was all about discovery and it didn't disappoint. It even had an interactive exhibit where you type in your Instagram account and 100's of small monitors create a visual collage of you account. I would call the whole experience part shopping and part museum. Until my next trip....thanks for following! The last leg of my trip took me to Toulouse for a couple of days of rest and relaxation. If you've never been, it's definitely worth the trip. Toulouse is the fourth largest city in France and it's located in the mid Pyrenees. It's a very young city due to its high concentration of universities. I would describe it as a mix of Harvard Square with a twist of Spanish influence. It is an amazing city to walk in and has a great central square. No taxis or metros are necessary here. Narrow cobblestone pedestrian streets, friendly people and fewer tourists. It's got a world famous opera house and it was fun to watch people all dressed for the performances. I am by no means a food critic but this place had amazing food. It's a combination of French and Spanish influences. I had a Spanish style " bouillabaisse " at Emile's one night and it was out of this world. Another Toulouse speciality is violets and they have managed to use violet flavor in just about everything. Violet marshmallows, violet liqueur, violet chocolate and many many more items. I'm not so found of the flavor but it looks pretty. I also stop in at La Compagnie Du Chocolate. This place was to die for if you love chocolate. The owner was eager to let me take pictures and describe her process for French fudge. It doesn't include butter! can't wait to see my family. Savoir Faire Home was mentioned in The February 3rd Boston Globe! We've carried Swedish Dishcloths for a year now. We have a hard time keeping them in stock. They ARE great on countertops and any kitchen or bath surface...so cute too! THEY ARE BACK IN STOCK IN MANY DIFFERENT PATTERNS AND COLORS!! It is time to say goodbye to Paris but not before I mention my new favorite hotel. Located in the Latin Quarter near St. Germaine and Notre Dame is this beautiful quaint hotel called Relais Christine. Located on 3 Rue Christine, it is a little slice of heaven and a welcome respite from the hustle and bustle of the city. Nestled in a small alley, it's quintessential French at its best. Each room is decorated differently. My room was covered in Pierre Frey fabric with soft lavender toile on the walls and accents of grey. It really made a beautiful combination. Every time another room opened its doors, I tried to sneak a peek! The lobby was small, cozy and inviting…made you want to hang out and people watch. The breakfast was included in the price of the room and served in the stone cellar. It was just an incredible space and seemed untouched through the years. Two great restaurants worth mentioning are Chez Fernand and Restaurant AG. Chez Fernand seemed to be favored by the locals while Restaraunt AG, though more touristy, presented their dishes like works of art…almost too pretty to eat! It seems the recent tragic events in Paris have impacted the design community. Every year there seems to be one bright luscious color that takes hold of this great design event. In years past, I've seen bright orange, deep purple and turquoise in everything from bedding to lighting and furniture. This year, the colors are very dark, muted and a little somber. Deep blues, subdued grays and taupes are everywhere. The contrast of black juxtaposed with white is the only real attempt at color. But luckily, like fashion, color will return! Today, as I was walking through the show, I came to a "booth" decorated in traditional French Haussmann style architecture. I was truly amazed when I got close enough to realize it was all done in wallpaper. The trompe l'oeil effect was so authentic and beautiful. This French designer has created a line of wallpaper, wall coverings,vinyl rugs and pillows in a wide variety of trompe l'oeil effects. Wall coverings that mimic a birds eye view into some of Paris' most elegant apartments. The vinyl floor coverings mimic perfectly aged French hard wood floors and antique tin tiles. I can already envision so many applications for this sophisticated and stylish French product. Where do you go when you're looking for inspiration and design trends? you go to Maison Objet, one of the largest and most innovative home design shows in the world. Here you'll see everything from designer textiles,handcrafted furniture and the finest in home accessories. I arrived on a very cold morning and quickly warmed up after my first cup of French cafe au lait. There's nothing like French coffee! Within 10 minutes of my arrival, I stumbled on a Portuguese glassmaker. The company, run by a mother and son duo, makes the most beautiful colored glasses, dishes and table top items. The jewel tones of the glass candlesticks would be perfect in almost any room in your home. I can't wait for these to arrive in time for Spring. Next up on my list is a favorite for many Savoir Faire Home clients. Arte Pura from Italy creates some of the most elegant and sophisticated table, bed and bath linens that are like nothing else I've ever seen. I've ordered them in a variety of muted tones and each one is adorned with hand applied crochet and lace. These are so special. This year I added some of Arte Pura's candles. Each candle is decorated with wax lace. As the long day was coming to an end, I was happy to see a familiar face. Sergio from Bella fabrics greeted me with a big Italian hug. Bella fabrics produces fine Italian wool and cashmere blankets and they were a big hit at Savoir Faire Home. His new introductions include hand embroidered wool in the most incredible designs. The quality of their workmanship is incredible. A trip to Maison Objet will always include a sighting or two of the most bizarre. This year didn't disappoint me. Here is just a few of the craziest things I saw. A refrigerator covered in blue fur! Pillows and benches made from hay. Yes, real hay! Finally, florescent colored Turkish olive jars. Place sqash in heavy 4 quart pot with chicken stock. Cook over medium heat until tender – about 15 minutes. Using a slotted spoon, transfer squash to a blender or food processor. Blend until smooth. Stir stock into squash puree. Set aside. In same pot, melt butter, stir in flour and curry. Cook, stirring over medium heat until smooth. Add pureed squash mixture to pot. Increase heat to medium-high heat and stir until soup thickens slightly. Reduce heat and add ½ and ½. DO NOT ALLOW SOUP TO BOIL AFTER THIS POINT. Add lime juice, salt and pepper. Ladle soup in to tureen. When ready, serve in bowls and serve immediately. Start your Thanksgiving feast with Harvest Bisque soup. wonderful on your own table or to take to your host's home. Just back from FALL High Point, NC Market! Fell in LOVE with this little sled! for our interior design clients. ...with a pop of something unexpected. We are excited to share some of our finds with our customers! The bathroom was handicapped accessible and outdated. Moving the shower and expanding it with a seamless glass door made it the focal point of the bathroom. The shower subway tiles are honed marble. Flooring is natural stone. The layout allowed for double pedestal sinks to complete the look. 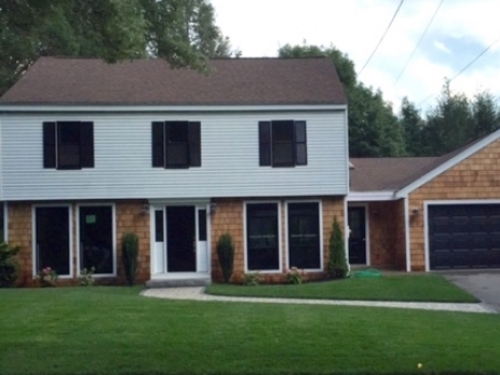 Savoir Faire Home recently completed a total renovation of this lovely 1950's Garrison Colonial in downtown Andover. Our goal OUTSIDE was to update the look without changing the structure of the house. This home has good "bones"! 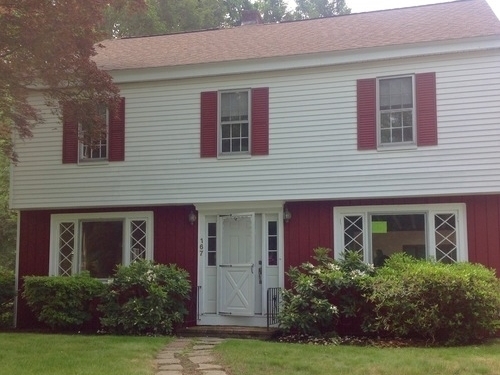 Replacing the red clapboard with cedar shingles, putting in new black windows and floor to ceiling ones on the first floor and updating the front door went a long way in changing the look of this home. New landscaping, granite steps and walkway and black shutters completed the look. The front of the house – the dining room, kitchen and living room – were all separate rooms and very dark. My goal was to open up the space to allow more light in and make the space more useable. We pulled the wall back in the dining room and took out the built in china cabinet. This opened the space into the kitchen. The floors are stained in 50% Jacobean and 50% Ebony. Removing the wall between the kitchen and family room further opened up the space! An open floor plan immediately updated the first floor. 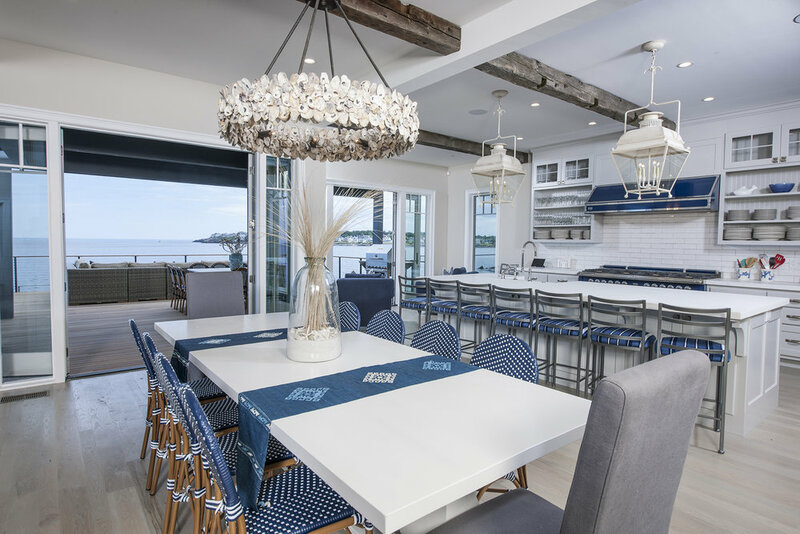 The counter top accommodates 5 counter stools. Cabinets are all custom in "Grandma's China"- a wonderful soft grey. Countertops are honed marble. Next up, is the bathroom update!